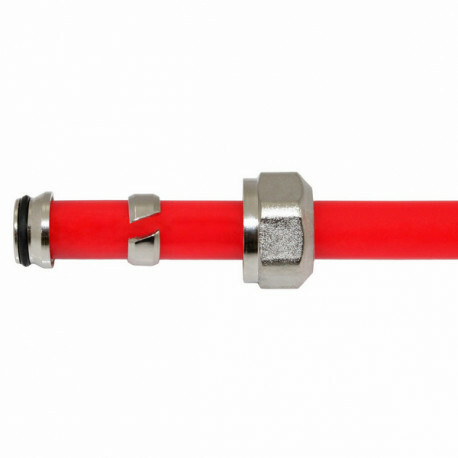 5/8" PEX Compression adapters are used to connect 5/8" PEX tubing to the radiant heat manifold's outlets. Each adapter consists of a PEX insert, a compression ring and a nut. PEX insert is crimp style, and is compatible with all types of 5/8" PEX tubing (A, B or C), including Everhot, Watts, Zurn, Nibco and many other brands. These adapters do not require any PEX tools or rings - simply use a crescent wrench or adjustable pliers to tighten the nut over the manifold outlet. Adapters are free with any manifold purchase - leave a note at the checkout page to request any particular size of adapters.